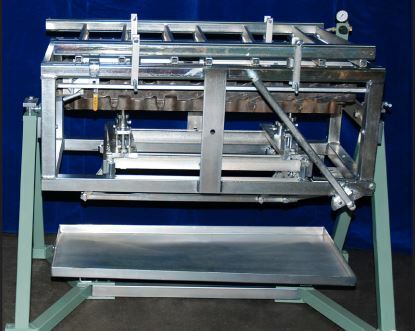 Originally designed by a Canadian engine rebuilder, our extremely robust Delta pressure testing rig offers a work piece capacity of 1220 x 380 x 178mm. Replacing an earlier inferior set up we are pleased to report that Delta have given more thought and provided more equipment and stronger clamps than many other manufacturers. Welded using heavy duty box section steel, the zinc plated main section is mounted on a strong painted steel framework supported at each end on bearings which allow the main centre section to rotate through a full 360 degrees. This allows full inspection of the work piece during the testing procedure. Fully adjustable jacking posts accommodate all shapes and sizes of both cylinder heads and blocks and will easily accommodate jobs of varying depths. Once mounted on the posts, strong cross bars sliding within the frame are used to retain the sealing pads. Side and end ports are sealed effectively using screw up clamps and universal closure devices. All pads are neoprene faced to ensure an effective seal. 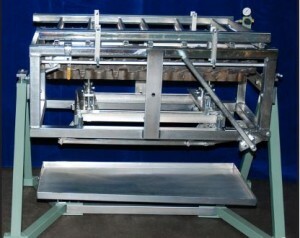 Once mounted with all sealing pads in place, a unique cam operated cradle lifting system compresses the job to apply even pressure and effectively seal off all waterways. We have a special fixture to enable the testing of “V” blocks and an extended framework for extra deep / tall jobs. Once sealed, an air inlet valve is used to introduce air pressure via a specially adapted sealing pad. Once full pressure is achieved the air inlet is closed off and any pressure drop recorded using the integral pressure gauge. A drop in pressure indicates a fault in the casting being tested and will required further investigation to determine the cause. Most types of cylinder heads, blocks and even oil and EGR coolers can be tested. A cylinder head or block can be sealed so effectively that a leak-down test can be carried out at up to 60 psi.